In my high school biology class, there was a fake skeleton that hung on a hook on a little rolling rack. The teacher rolled this skeleton around the room to show us stuff. Bones, mostly, it being a skeleton and all. 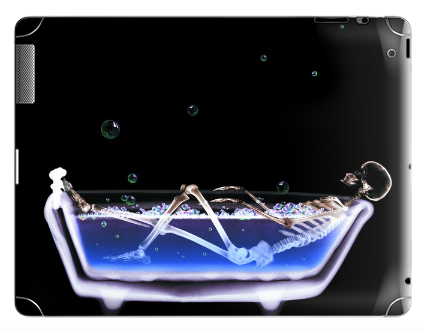 Skeletons are cool and CyberInkOnline owner Jean Griffin has created a line of skeleton-themed products that prove the point. These aren’t your typical images of skeletons because they aren’t just hanging on a little rolling rack or looking at you with creepy not-real eyes. Instead, these are sitting en masse at a conference table having a meeting, taking baths and even swimming. 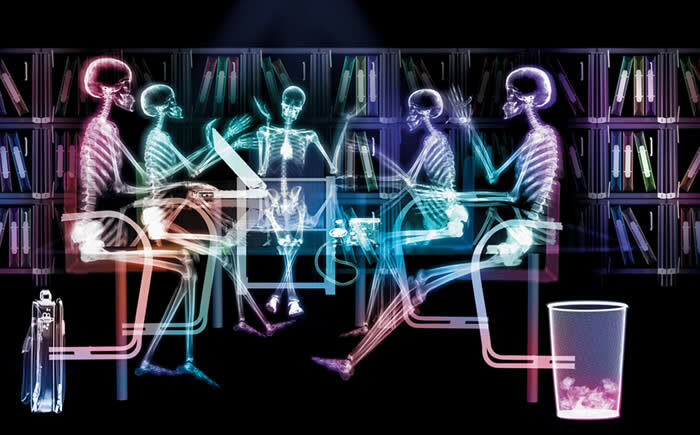 Jean got the idea after coming across a CD of images with skeletons leading everyday lives. She was intrigued, bought the image rights, and then tried to figure out what to do next. Eventually she started putting these fantastic images on posters and calendars, which led to a whole line of products. You can even get them on iPad cases and iPhone skins. CyberInkOnline products are now found in bookstores and museums throughout the country, often in conjunction with Body Worlds exhibits. They can be purchased online and are the perfect gift for the biology teacher, doctor or nurse in your life.